Taking on a rescue dog can be a life-changing experience. These dogs often come with a host of problems, but once you gain their trust, your new-found friend will love you forever. Many people are unprepared to give a home to a rescue dog. They assume the experience will be no different from bringing a regular pup home. However, rescue dogs are a different breed, so it pays to be prepared. 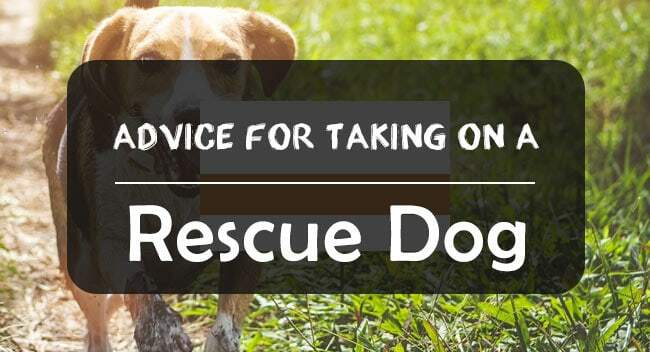 Let’s cover some basic advice when it comes to taking on and training a rescue dog. Rescue dogs may have come from abusive homes. Many rescue dogs were badly treated by their former owners. Don’t be too surprised if your rescue dog has serious trust issues. It can take a while for rescue dogs to get used to being handled. Let them do things in their own time before starting any serious training. Don’t assume that your new dog wants to be cuddled and petted. He might not want you anywhere near him in the beginning. Be quiet, patient, and above all, kind. If he backs off from you, carry on as normal. Give your dog food and treats and talk to him in a soft voice. If you are patient, he will gradually learn that you mean him no harm. Once you build the trust, he will become a loving member of your pack. Separation anxiety is another common issue with rescue dogs. They may have been abandoned by a former owner, so the fear of abandonment is strong. A lot of rescue dogs struggle with being left, especially those that form a close bond with their owner. You might notice them reacting to every sound, pacing in an erratic cadence or standing with their tail between their legs. These are sure signs of being on anxious alert. Don’t leave your rescue dog for extended periods. This only feeds into their fears. In the beginning, you might not even be able to leave the room without them panicking. Build up slowly. Start by leaving your dog for 5-10 minutes at a time. Give them some treats and toys to keep him occupied. Leave the radio on – dogs often find classical music soothing. Make a fuss of your dog when you come back and give him some treats if he’s been good and not damaged anything. If your dog suffers extreme anxiety, try CBD oil for dogs. This completely natural product is safe for pets and is known to alleviate anxiety in dogs and cats. If all else fails, you may have to consult a canine behavior therapist for professional advice. Rescue dogs sometimes have toilet issues. Some dogs were rescued from the streets and they have no clue about where to go to the bathroom. It can take time to teach them that it’s not OK to pee and poop indoors. Again, be patient. Take your dog outside as often as possible and praise him when he does his business in the right place. Be methodical and take him outside after meals, before and after bed, and several more times in the day. You may need to restrict him to one or two rooms in the early days to minimize the mess, but he should learn fairly quickly. Training a rescue dog can be challenging at first, but the effort is worth it because they can be wonderful pets. Are you ready to give a needy dog a second chance? Let us know!